Here is a story from this week’s trip to Arizona, where I attended a retreat led by James Finley, preached in Tucson, and hiked in the desert. What value does a mountain have? In 1949 the Portland Cement Company built the first cement plant in Arizona, 20 miles northwest of Tucson. They built the plant about four miles from Twin Peaks, a pair of small mountains that rose side by side from the desert floor, and they set to work extracting limestone from one of them. The business of digging into the mountain proceeded swiftly and efficiently, especially after a covered conveyer belt nearly four miles long was built in 1972: it could transport up to 800 tons of limestone and shale from the quarry to the plant every hour. By then the plant was operating three kilns, each one longer than a football field, and supplying the growing cities of Tucson and south Phoenix with 3 million barrels of cement every year. There are several ways to tell this story. Is it a tale of humanity’s cleverness and ingenuity? Of how adept we are at exploiting natural resources to satisfy our comforts and needs? Thanks to limestone and the other industrial minerals that are mined in Arizona, consumers enjoy products that we use every day, from cement to brick, from tile, glass, and asphalt to trains, planes, and cars. You might call this is a success story: because of the cement company, countless jobs have been created, families fed, and buildings constructed. Or is it a cautionary tale? I gaze across the desert, looking at the empty space where a mountain once stood, and mourn the loss. Twin Peaks exists now only in name and memory. 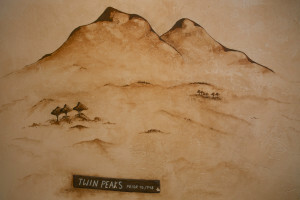 A drawing of the two peaks as they looked before 1948 is sketched on the wall of a nearby ranch. Seeing what remains of them now, it is hard not to think of a radical mastectomy. Meanwhile, the economic engine keeps pounding. Every year in Tucson, more acres of desert are scraped bare, more subdivisions are erected, and more houses clamber up the mountain slopes. Year by year more saguaro are cut down, more animals are displaced, and more groundwater is pumped out to farm the desert and to feed the sewer systems, fountains, and swimming pools that accompany the construction that cement makes possible. 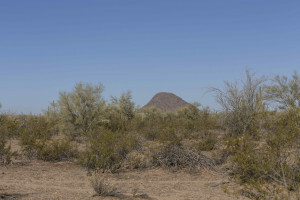 The Sonoran Desert is large, and in theory there is still plenty of space for human habitation to expand. But what seems like the possibility of endless growth, a march of Manifest Destiny into the desert, is just a mirage. A few days ago officials in Arizona made the startling announcement that in as few as five years, Tucson and Phoenix could face cutbacks in their deliveries of water from the Colorado River. The metropolis that swallowed up a small mountain is now sucking its water reserves dry. Is this a parable of a civilization in peril? Of a society that can’t stop itself from gobbling up the Earth upon which all existence – including its own – depends? What value does a mountain have? Does it matter when a mountain is lost? I walk into the desert to pray. To my right, I glimpse the lone remnant of Twin Peaks, looking odd and forlorn, an amputee. Straight ahead is a grand ridge of mountains that rises near the border of Saguaro National Park. Eagerly I study the ridge’s contours and jagged cliffs. I watch shadows play across its flanks as the sun rises, and I sense its vast and solid bulk. Who are you, Mountain? What is it like to be you? Who am I to you? Who are you to me? My interchange with Mountain is carried out in silence by intuition and imagination. I give Mountain my steady attention, observing everything I can. I notice that it is producing nothing, achieving nothing, planning nothing, regretting nothing. By human standards it has no purpose at all; it simply is. I sense its inscrutable existence beyond the grasp of human thought. I sense its silence, and my mind grows quiet. I sense its wildness, and my spirit stirs. I sense its freedom, and my spirit takes flight. In the company of Mountain, I am restored to myself and filled with joy. It is strange that an impenetrable mountain can become a doorway to the Holy, strange that from arid rock we can drink from a river of life. I wonder if human beings discover our true identity only in relation to something that is greater than ourselves. What value does a mountain have? From the mountains of Sinai and Zion to the Mount of Transfiguration, Mount Athos, and beyond, we know that mountains are a place of encounter with the divine. Their value is beyond human calculation. It’s no wonder that groups such as Christians for the Mountains are active in trying to stop mountaintop removal in West Virginia, for even more is at stake than protecting clean air, clean water, decent jobs, and public health. What’s ultimately at stake is protecting our relationship with God. 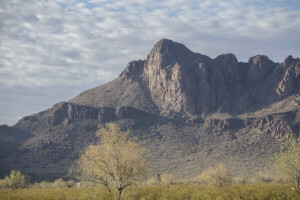 Tucson has lost a small mountain, but, God willing, those who live and work in Tucson, and those who visit, will learn something essential from the mighty mountains that remain. I hope that we humans never lose our capacity to cherish mountains as more than scenic backdrop to a swimming pool and more than deposits of limestone or coal. I pray that we humans rediscover the intrinsic value of wilderness and perceive its holiness. Sometimes such places remind us, as nothing else can, that we belong to a sacred mystery whose wild, more-than-human presence gives value and meaning to our lives. • “The Heart of Creation: Cultivating Hope in a Wounded World” on the weekend of July 11-13, 2014, at Adelynrood Retreat & Conference Center, Byfield, MA. See the Events page on this Website for more information. Sermon for the Second Sunday in Lent, February 24, 2013. Delivered by the Rev. Margaret Bullitt-Jonas, Grace St. Paul’s Church, Tucson, Arizona. Listen to an audio recording. It is wonderful to be back at Grace St. Paul’s and to worship with you again. I am delighted that today’s readings bring us the story of our brother Abram, this man who longed so much for life to flow through him. You know the story  Abram and his wife Sarai were old, and they had no children. Although the couple yearned to bear a child, Sarai was unable to conceive, and to all intents and purposes it seemed impossible that they would ever have biological descendants. Yet the word of God came to Abram in a vision, and Abram received that mysterious assurance that only comes when our minds grow quiet and we listen attentively in the silence. “Do not be afraid,” God whispered in Abram’s heart. “I am your shield.” And then, on that memorable night, “God brought [Abram] outside and said, ‘Look toward heaven and count the stars, if you are able to count them’” (Gen 15:5). You live right here in the Tucson desert, so you know what that’s like: you go out into the desert on a quiet night, you stand in the company of ancient mountains, you look up, and you see a sky brimful of stars. Even if you’ve seen it many times before, you can’t help but be seized by amazement. Wherever you look, there they are: stars and more stars  more constellations than you could possibly name. Abram couldn’t count them any more than we can, and in that moment of silent wonder, he heard God’s promise: “So shall your descendants be.” Now comes the story’s pivotal sentence, the sentence on which everything depends: “Abram believed Yahweh.” He believed Yahweh. He trusted that somehow his longing to give life would be fulfilled. In the silence of his heart, he heard the divine promise, and he believed what he heard. He accepted it. He put his trust in it. No, let’s put it in stronger terms  he committed himself to that promise, even though there was no tangible evidence to back it up. I relish this story of Abram because he is the archetype of every person of faith. Abram is a spiritual companion to everyone who feels a deep longing to be fruitful and who dares to trust that somehow that longing will be fulfilled. Of course the desire to give life can be expressed in all kinds of ways. Sometimes it takes a literal form, as it did with Abram and Sarai, in our desire to conceive and bear children, and to raise a family. But the desire to give life is expressed in many other ways, too  by the desire to heal or to reconcile, by the desire to speak truthfully and kindly, to be patient and to listen more carefully, by the desire to create something beautiful, to tend a garden, feed the hungry, work for justice, or in some other way to make the world a better place. Whoever we are, whatever our age or circumstances, God has planted deep within us a desire to bear fruit, a longing for our lives to be a blessing to those who come after us. We want to bless the future by the choices that we make today. We want life to flow through us  through our hands and words and thoughts and actions. That’s no surprise, really, for that is what Jesus came to do: to give us a path to life. “I have come that you may have life,” he tells us, “and have it to the full”  or, as another translation puts it, “I have come that you may have life, and have it abundantly” (John 10:10). “I am the bread of life,” he says (John 6:35). “I am the Way, the Truth, and the Life” (John 14:6). And whatever Jesus has, he wants to share with us (c.f. John 14:20, 15:4, 14:27, 15:9, and 17:21-26). Then, a few days later, on the first Sunday in Lent  last Sunday!  somewhere between 35,000 and 50,000 people gathered on the Mall in Washington, DC, in the largest climate rally in history, to voice their opposition to the Keystone pipeline and to urge a swift transition to clean, safe, renewable sources of energy. Can it be that the climate movement in this country has finally sprung to life? Can it be that the God who lures and coaxes us to become agents of life is speaking now in the hearts of men and women all over the country  and indeed, all over world  inviting us to stand up and speak out and change course? The battle for life to flourish on this planet is just that  a battle. Energy companies already own a pool of fossil fuels that is five times larger than the amount of fossil fuels that  if burned  would catapult the global climate into catastrophic, runaway change. So we are fighting to keep that carbon in the ground, where it belongs. We are fighting for our future. We are fighting for a habitable planet, and for the survival and flourishing of life  not just human life, but life as it has evolved around the world. Standing up for life can be risky, as Jesus well knew. In today’s Gospel passage, some friendly Pharisees warn him to turn back, because Herod Antipas wants to kill him. But Jesus refuses to step away from the life-giving path along which God is leading him, whatever the cost may be. “Today, tomorrow, and the next day,” he replies, “I must be on my way” (Luke 13:33). In short, he won’t be stopped. Like Abram, Jesus chooses to live by faith. He puts his trust in the unseen God and keeps going. No wonder it’s so inadequate to think that we who follow Jesus are a fixed institution or cling to a rigid set of beliefs! The Church is not a building  we’re a movement! We’re a community of people joined with Christ through the power of the Holy Spirit, and we are on the move  like Abram, like Jesus  to stand up for life in an often death-dealing world. How is God inviting Grace St. Paul’s to take a leadership role in this city and in this diocese in addressing climate change? I know that you already have a strong Creation Spirituality Ministry here, and I salute you for that! Maybe there is more you would like to do. Maybe you will want to join the Annual Ecumenical Lenten Carbon Fast, which delivers free daily emails during Lent, with suggestions for reducing your carbon footprint. Maybe you’ll want to discuss divesting from fossil fuel companies as a symbol of your commitment to heal the earth. Maybe you’ll want to convene conversations among lay people and clergy in the diocese about how to create a political economy that does not depend on ravaging the earth, or how to build emotional resilience in the face of almost inconceivable loss, or how to help each other move past our fear and despair and to keep listening for the voice of a loving God. Now is the perfect moment to stand up for life, for we’re living at a pivotal moment in human history when our choices really matter. As philosopher Joanna Macy points out, we live between two competing possibilities: the possibility of life unraveling on this planet and the possibility of creating a life-sustaining society. We don’t know how the story will end, so it matters what we do. It matters whether or not we are growing in love for ourselves, for our neighbors, and for the earth on which all life depends. It matters whether or not we are finding a way to become healers and transformers in a troubled world. I give you  polar bears. I give you  glaciers. I give you  coral reefs. I give you  ice shelves as big as a continent. I give you  moderate weather. I give you  a stable climate. May God sustain and bless our efforts in the years ahead. 1. “Thin Snowpack in West Signals Summer of Fire and Drought,” by Jack Healy, http://www.nytimes.com/2013/02/23/us/in-drought-stricken-heartland-snow-is-no-savior.html. 2. “Ash Wednesday 2013: A Good Day To Be Arrested as an Advocate for God’s Creation and for Future Generations,” by the Rev. Dr. Jim Antal, Minister and President of the Massachusetts Conference of the United Church of Christ.